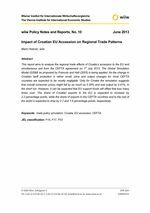 This report aims to analyse the regional trade effects of Croatia’s accession to the EU and simultaneous exit from the CEFTA agreement on 1st July 2013. The Global Simulation Model (GSIM) as proposed by Francois and Hall (2003) is being applied. As the change in Croatian tariff protection is rather small, price and output changes for most CEFTA countries are expected to be mostly negligible. Only for Croatia the simulation suggests that overall consumer prices might fall by as much as 0.39% and real output by 0.41%, in the short run. However, it can be expected that EU support funds will offset that loss many times over. The share of Croatian exports to the EU is expected to increase by 2.2 percentage points, while the share of exports to the CEFTA countries and to the rest of the world is expected to drop by 0.7 and 1.5 percentage points, respectively.